The ECB should cut deposit rates below zero and consider a bond-buying program to help Europe escape recession, according to the OECD. 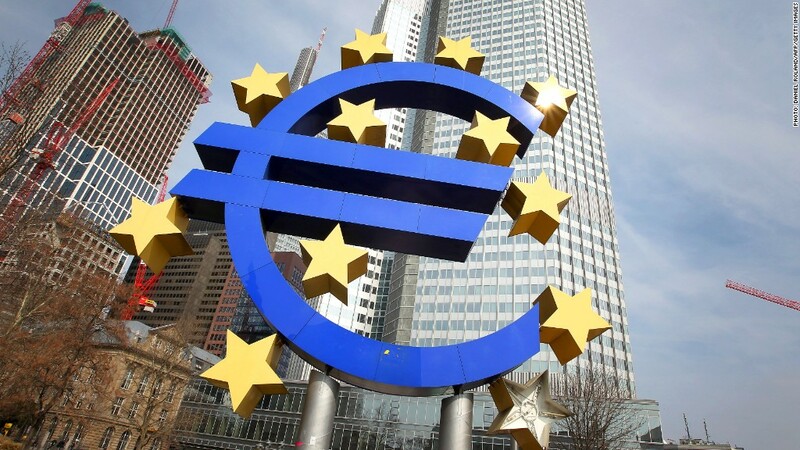 The European Central Bank should follow its recent interest rate cut with more radical action to tackle recession and record unemployment, the OECD said Wednesday as it slashed its forecast for the eurozone economy. The Organization for Economic Co-operation and Development said it expected gross domestic product in the eurozone to contract by 0.6% in 2013, compared with its previous forecast for a fall of 0.1%. The OECD is slightly more pessimistic about the prospects for the eurozone than the IMF, which sees a 0.3% decline, the European Commission, which projects a 0.4% decline, and the ECB with its 0.5% drop. The recession has already lasted for 18 months, marking the longest period of contraction in activity since the euro was launched in 1999. While welcoming the central bank's move to cut its main interest rate to a record low of 0.5% earlier this month, the OECD said it should take advantage of downward pressure on prices to take bold steps or risk contributing to stagnation with negative implications for world growth. "The ECB should supplement its recent cut in the refinancing rate by reducing the deposit rate to below zero and issue forward guidance based on inflation prospects," the OECD said. The ECB has said it stands ready to do more if the economic recovery fails to materialize. It also has discussed negative rates, which could ease a credit squeeze by encouraging banks in depressed southern Europe to lend more money to businesses and consumers rather than leaving it on deposit. That may not be enough, however, and the OECD believes the central bank should consider other "unconventional measures" including asset purchases, or quantitative easing -- a tactic deployed by the Federal Reserve, Bank of Japan and Bank of England. The OECD also urged European policymakers to overcome "reform fatigue" to push on with fiscal and structural changes, although the pace of austerity may have to be eased to take account of weaker economic activity. The European Commission on Wednesday is expected to give France, Spain and the Netherlands more time to bring their budget deficits down to 3% of GDP. EU leaders should also complete a eurozone banking union, a move seen as essential to removing another drag on recovery by repairing the financial sector and preventing bank failures from triggering sovereign bailouts, as witnessed most recently in Cyprus. But EU states are divided on how to build on December's deal to give the ECB supervisory authority for over 130 of the region's biggest banks representing 85% of eurozone banking assets. At issue is how to create a single agency with authority to restructure or wind up collapsing banks, and a fund to cover the costs. Europe also needs to agree how bank losses are divided between shareholders, bondholders and depositors. "As euro area policy has often been behind the curve, perceptions of strong disagreement among member states could have negative consequences on confidence and exacerbate fragmentation," the OECD warned.